I had a damn good year targeting false albacore last year. It was spectacular. I was on them very early in CT, likely being one of the first to catch from the rocks here in 2017. And then I got one on the West Wall on November 7th, which may be one of the latest albies caught there ever. My friend Steve Fiori, who practically lives on the west wall during the bonito and false albacore bite windows, told me he had never heard of anyone getting one that late. Last year was just a special year. My track record was very good. I stuck albies on all but one day targeting them from the rocks. Seriously! Only one trip with no hook ups. I was really damned proud of that. I still am, actually. 2018 has been very different. Very, very different. I got one bonito after a bunch of attempts. Then slogged through the early albie season with no real success. Then I had one decent day with Patrick Barone where we hit a good number of fish on spinning gear and I stuck one on the fly. Fast forward to the window that ends the typical albie season: The last week of October. A big nor'easter was coming, and it seemed big enough that is could muck things up enough to push the albies out... maybe. Last year we had an even bigger storm around the same time and the fish stayed in for another two weeks, in fact some of the best albie bites of the year happened after that storm. Regardless, I was pretty pessimistic about catching even one albie on the fly from the rocks this year in the days leading into this big storm. Dan and I found ourselves fishing the battered surf zone early Saturday morning, with a stiff 20-30kt wind out of the northeast gusting even stronger, a deep low approaching from the southwest, and big swells sweeping in from the southeast. 40 degrees. It should have been good big striper conditions, and indeed they were. Except for one variable I should have take into account: mud. I did think about that, I always take it into account in the spot we were fishing. But I am generally far more concerned about it with a straight easterly and a higher incoming tide. This tide was obscenely low. It was in stark contrast to the visuals later in the day when roads had to be closed and property was damaged by coastal flooding, not uncommon with these extratropical systems and their broad low pressure areas. The wind was coming of the land, not off the water, so the crashing surf wasn't really something I counted on. Not to the degree that it was occurring that early in the storm. To avoid prolonging the point any further, we caught diddly squat in that first area. After filling up and drying of slightly we moved west and found out that we should have started there. The tide was ripping around the tip of a jetty and the bass were holding right there, tight to the rocks. Casting barely necessary. Dan and I caught some obscenely fat schoolies there and had just enough time to realize that there were some big fish there before the tide started picking up dead eel grass down the beach and dumping all of it into our spot, ruining our bite. We found fish in another spot that we could have sat on for a long time, but we didn't. We went looking for albies. Really, for no good reason. But when we saw fish breaking out in the bay as we rigged up I started to actually think we'd have a chance. I didn't have my usual albie arsenal with me so I just threw on a chartreuse clouser. And I started walking out to the spot I jokingly told Dan "Five casts and I'll be into a solid ten or twelve pound albie". Five casts later, I watched a roughly 10lb false albacore launch near vertically for my chartreuse clouser, and I was on my first shore bound albie of the year. This was my first time getting one on the new-ish 10wt, and it handled that fish more than admirably. I was able to keep it within 120 feet of me at all times. So, at worst I can say I ended 2018 with two albies on the fly total and one from shore on the fly. In other words, the total number of albies I got on my first day targeting them last year, and half as many as I got from shore on my first day of targeting them last year. I wish I could do anything other than have a sort of melancholy chuckle about that. The albies are not long from being hopelessly absent around here, but the striped bass, and maybe a few bluefish if we are so lucky, are not going to give in for a couple weeks. Tomorrow might be a pretty incredible day for Mark Alpert and I. We shall see. This isn't the greatest time of year for trout on a lot of my local rivers. I try to stay out of the waters where wild trout are up on redds, most years the bigger creeks have only a handful of holdovers, and there's only one stocked river that I can get to on the average day. I've been a little lazy these last few days, and have been meaning to get up to some streams to the north that I love fishing this time of year. Maybe tomorrow? I hate myself when I'm this way, I get nothing truly productive done most of the day outside of my typical day-to-day work, and yet I still manage to mentally exhaust myself. It's lame. ...the only wild fish I've caught on an egg in the last seven days despite fishing eggs for hours in the right water. That, and I have yet to see browns and brookies on redds. Soon though, the first two weeks of November are prime time for redd watching. So, if the wild and holdover browns and brookies aren't yet spawning, why would I choose to fish eggs right now, aside from the fact that stocked rainbows are dumb. Actually, that's why. Some of the state's stocked rainbows are so dumb that they try to spawn shortly after they are stocked in the fall. 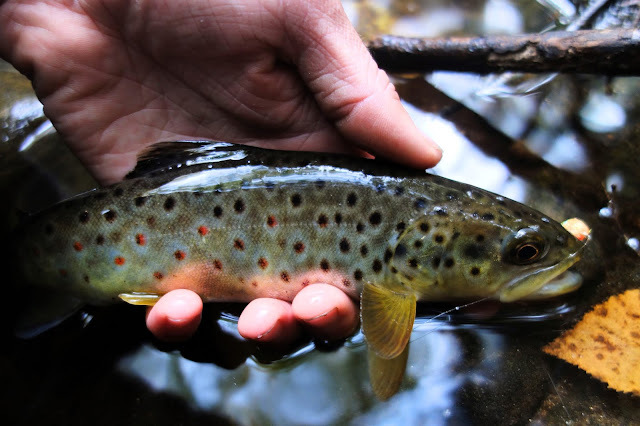 I very often see them attempting to spawn, though they don't seem to be very successful redd builders, and I can't count the umber of fall stocked bows I've caught in CT that have dumped eggs or milt while being handled. So, with some eggs ending up in the drift from these dumb stocker rainbows, egg patterns become an even better method to dupe said dumb stocker rainbows. It's almost too easy. If, that is, you know how to high stick. Late October and early November in CT are probably the best window in the fall run for a fly fisherman to get a big striped bass. 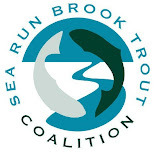 There are big stripers around throughout the run, but oftentimes some of the last fish to push through CT are both really big, and willing to come into waters where they are fly targetable. Whichever full moon and new moon phase that is closest to Halloween is a prime objective. Noreasters can also spur a bite. 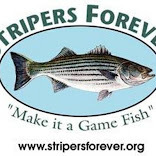 So, for those of us who are really serious about catching stripers, this time of year often means we'll be spending a few cold, wet, possibly windy nights on the water. Many of them will be fruitless. Many of them will produce lots of fish. A few of them will produce one or two really large striped bass. This post is about one night that produced a lot of fish, no real big ones, but was one of the more unusual nights on the water I'd ever had. Mark and I set out on the night of the full moon with no really signs that that moon was there. The sky was turbulant that night, and southern New England was seeing a late season storm system that featured a couple tornadoes, waterspouts off Cape Cod, and some of the best lightning I've seen all year. By the time we got on the water the storms were nowhere near us. But they were still showing off. I watch one cloud to cloud lightning bolt travel what must have been 30 or 40 miles from one end of the line to the other way out over Montauk. Combined with the bright white full moon emerging out from behind the clouds, the calm and crystal clear water, coyotes howling in the background... yeah, the ambiance was something special. It made the fact that we were on a weird small fish bite more palatable. Yeah, we were getting a fair amount of takes, but they were all pretty small fish and very, very subtle at our first spot. Most were just a light bump. Very easy to miss. And miss them I did, getting about one in five takes. It would be hard for me to swallow that kind of hookup ratio if these fish weren't all 18 inches. when the tide stalled and turned, so did the bite. Often when the tide slacks off you are presented with a chance at the biggest fish of the night, and indeed right when the water slacked off completely I heard a few big pops way out of range. But neither Mark nor I were connected after the tide slacked. We moved, and as we walked to within ear shot of the up-current side of the bridge we were going to fish we could both see and here the fish popping. We were then treated to hours of a slow, steady pick of bass from 16-24 inches and then hickory shad later in the tide. It was fun fishing. And, for the second time that night, we had coyotes howling in the background. I do just adore this kind of fishing. There's a wind blowing lately, almost ceaselessly and always from the wrong direction. It isn't uncommon for it to get very windy in New England in the fall, especially when the temperature change makes a sudden a precipitous drop. Bu that makes it no less frustrating when it interferes with fishing the fall run. Over the last couple weeks this west wind has prevented me from getting on last shot at a false albacore. It has made fishing from smaller vessels all but impossible. It has made getting out and looking for that big bass that I desperately want to get before the end very, very difficult. But if you want to catch striped bass on the fly with any sort of regularity, it's put up or shut up. I wanted to show fellow fish head Brandon some good action last Saturday and I knew, wind or no wind, I could find him some fish. So we found ourselves on a wind swept, wave pounded beach just after dawn with thousands of striped bass boiling and jumping right in the suds at our feet and a hundred herring gulls struggling to get in on the action without drowning in the breaking surf. The wind held the bait tight to the beach lip and the marauding schoolies wouldn't let them push around the tip of the jetty to our west. They had the bait pinned in there for nearly an hour. It was an awesome morning, and honestly my photos and words can't come anywhere near capturing it all. 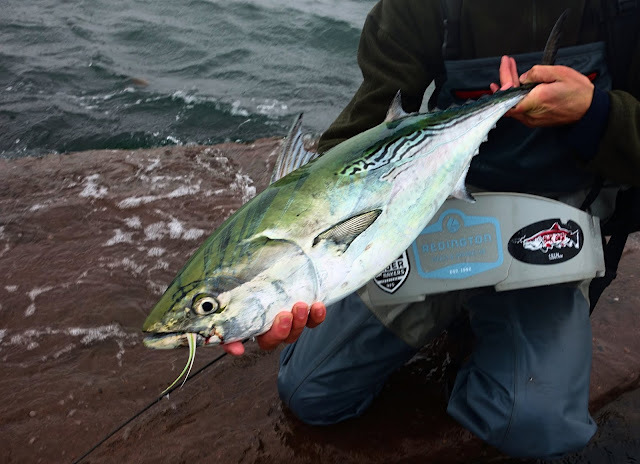 After that chaotic and spectacular morning blitz we slogged through the rest of the morning and afternoon looking for false albacore with nothing to show for it, fish wise. Brandon got to join the West Wall club, and Phil took us on a little South County tour. But eventually we had to make a move, and I made the call to got to one last spot. We found fish there. I broke of a cow, landed a few nice sized bass, and Brandon closed the day out with a moonlight bass. The wind was not so oppressive there, but it didn't feel as satisfying. Yes, I did come tight to the few best fish of the day, but there's something about standing knee deep, watching a foamy white wall of water push towards you with bait dripping out of it and bass leaping through it at every angle. I hate the wind and love the wind at the same time. This Saturday the wind is going to blow again, but from the opposite direction. It might just be the biggest day of the season. From late 2015 through the end of fall 2017, all of those who fish for, observe, and study wild brook trout in Southern New England got to see what these fish can do under severe pressure. It wasn't pretty, and I wish it on no wild trout population, but it was eye opening to see just how much they could put up with. It wasn't sustainable though: I think 3 more 2016's would have caused irreversible damage. Now, in late 2018, we get to see what happens to a wild brook trout when everything is in their favor. I've fished these streams for six, seven years now. This fall I'm seeing things I've never seen before. This fish is not underfed. By the time the foliage has peaked and is on it's way downhill, there are two things I have come to expect: leaf clogged pools and skinny brook trout. Summers weren't conducive for heavy feeding, which can increase spawning and heavy freeze mortality. Pools being leaf clogged due to the low and slow water probably wasn't too destructive and even provided ample cover, though in some places they undoubtedly smothered what could have been good spawning gravel. Though far less than a third of the leaves have dropped so far I don't see that problem manifesting itself this year given how good the flows are. Skinny fish is also a problem I'm not seeing, which is no wonder. There were serious blow outs through September, and that undoubtedly put a lot of biomass in the drift. I've been catching brookies that are heftier than ones I've caught at any other time of year with the exception of the early-mid spring feeding binge. I suspect the same variables have resulted in faster growth rates this season as well because the number of "big" brookies I caught in the spots I fished this week far exceeded what I'd seen in them ever before. This is what brook trout do when they are given the right circumstances, and this is what we should be striving to maintain or improve: thriving fish, not just surviving fish. This is what brook trout are supposed to do. Another advantage of high flows is the tendency for fish to move around in it. I saw them in the act last fall after a late October rain. Brookies were attempting to leap a waterfall that the most certainly wouldn't clear. It was a show of these fish's incredible urge to populate new water, a very advantageous trait for a fish that requires a fairly narrow water temperature and dissolved oxygen content to survive. One spot that ended up being very productive on Friday afternoon is one I have fished more than a dozen times and never once seen or caught a brook trout. I visit it mostly hoping to get a chance at larger redfin pickerel, but I've always hoped that one day I'd find that a pod of brookies had moved into that water. On this day I got lucky. I think the best piece of advice I can give to anyone trout fishing right now in Southern New England is to get it while its good, and don't expect the pattern to match with recent years. A lot has changed in my local water and this area hasn't seen anything different from anywhere else in the region. Expect the unexpected, look in areas there maybe weren't fish last year or the year before, and I think this fall, winter, and spring may be the best six months in the last four years to pick out some big small stream wild brookies and browns, maybe even the fish of a lifetime. This isn't the time to sit around at home wishing it was warm out. Fall is well underway. In fact, at this point it feels like the end is really in sight. I've got so much I want to do in a tiny little window of time, so forgive me if posts end up being a little late like this one. In the end it isn't what I intended to write when I started on Friday, but I think it may have ended up being more informative. Maybe. I am one lucky SOB. I say that for numerous reasons, but one of the top reasons is that virtually whenever I want I can exit my front door and be on wild brook trout water in less than five minutes, walleye/bass/pickerel water in three minutes or ten minutes, and a variety of other multi-species water in two minutes to ten minutes. It's Heaven for a non-picky angler like myself. But being able to get on a brook trout stream in five minutes is especially, well, special. There's been a little problem with the closest stream for the last few years though. It did not handle the drought years of 2015 and 2016 very well. The extent of the dewatering was horrible, in large part because of an extensive well system in the stream's headwaters. The oldest year classes got hit hard, really hard, and the number of fish I'd catch in a trip fell from 5-20 to 0-5. It was demoralizing to have this little gem of a suburban creek so devastated. Fortunately I found redds every fall. On those days I stopped making casts all together. Most of the time when I find brookies on redds in a stream I'll focus my efforts on the water where there can't be redds: Mud bottom, deep fast slots, and places with all-boulder substrate. Not all trout will spawn at the same time so I can still catch colored up fish without interrupting spawners. But in most of the streams I fish locally I couldn't even justify that approach. The populations needed the best chance possible to recuperate. The biggest trout I saw on redds in this nearby stream last fall were no bigger than 5 inches, most were 4. Then there's 2018. One of the wettest years I've fished through. Stream beds were dramatically rearranged and all year there's been tons of food n the drift, even with warm water temperatures all summer. Resulting in, as I discovered yesterday, the fattest fall brookies I've ever seen. It seems that a lot of these fish have grown absurdly quickly this season. On a short evening trip, just 25 minutes, I covered 50 feet of water and caught four brookies. Three of them were in the top four largest fish I'd caught in this disconnected stretch of the stream. The biggest is only beat out of first by one male I caught in the fall of 2015, at the time an anomaly of a brookie that I'd never seen the likes of before there. The amazing thing was how immediate it was. I got there, tied on a little hair wing streamer, and promptly caught the only male of the bunch. This could just be a fluke. Not a fair representation of the average. Maybe it was. And I'd take that for sure: three of the best fish in the stream in a 25 minute trip? Sign me up! But if that were true and it was a fluke, today would also have had to have been a fluke. A huge, enormous, massive, insane, wild fluke.